Looking for a new Rug or Door Mat to add charm to your home? At Bramley Carpets we have special partnerships with leading manufacturers such as Alternative Flooring, Fibre Flooring and Hug Rug which enables us to give our customers an extensive choice of high quality products at exclusive prices. We also offer a professional design service in-store with the bespoke 'Make Me A Rug' facility from Alternative Flooring which gives our customers the option to create and personalise a rug from start to finish. Transform a room instantly with a designer Rug from Bramley Carpets. 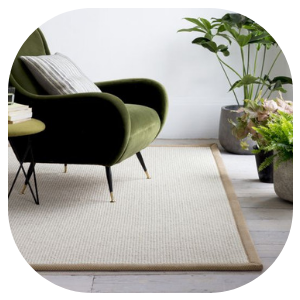 Our extensive options of colours, patterns and sizes from top manufacturers enables us to offer a unique collection of rugs suitable for any room in the home. When visiting our Heaton Moor showroom one of our friendly advisers will be happy to assist with choosing the right Rug for you, whether this be a stylish Handmade Rug or a luxurious Bespoke Rug which can be designed and produced exactly to your needs. Are you tired of seeing the same plain and boring Door Mat every time you walk through the door? Well visit us today and we'll make your entrance a memorable one with our array of patterned Door Mats that not only look great, but are eco friendly, pet friendly and most importantly great at trapping dirt. 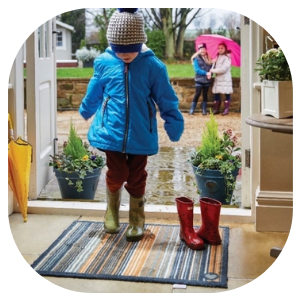 Our mats range from hard-wearing Coir Mats printed with inviting welcoming messages to classy striped and pin dot Rubber Door Mats which are specifically designed for use with luxury vinyl floors like Amtico and Karndean.